400+ million entrepreneurs worldwide are attempting to start 300+ million companies, according to the Global Entrepreneurship Monitor. Approximately a hundred million new businesses start every year around the world, while a similar number also fold. What sets successful firms apart are the innovations and resources they utilize that help them stay healthy and relevant. Such a large number of businesses means there’s data of astronomical proportions out there. Finding the right data is, more often than not, key to your company’s survival and growth. Visit each vendor physically (nigh on impossible) or scour their website, and get information on their shoes — model, size, color(s), price, stock availability, etc. 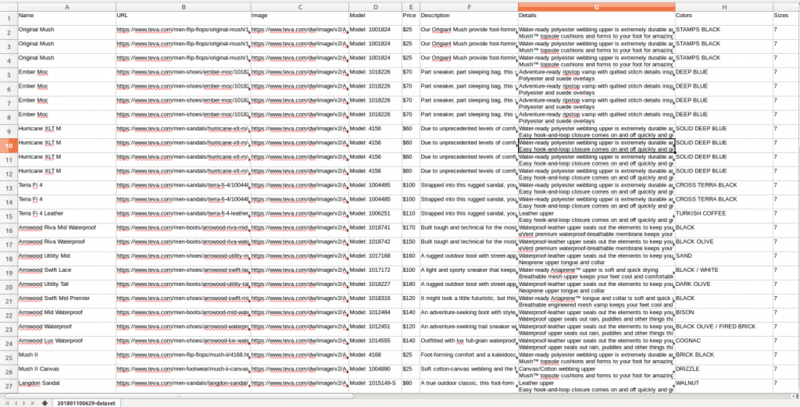 Then input all this info manually into a spreadsheet, CSV or your database. Ask each vendor to provide you with a copy of their inventory list or a custom file with only the information (columns) that you require. Option 1 already feels a lot tedious. Your hours and hours of effort brings you very little reward. By the time you’ve listed every item and readied your files for import, your vendor may have increased prices, introduced or discontinued a model, run out of stock, or what not. Back to square one! Option 2 appears a bit more promising. Some vendors might provide their inventory listings in a format of your liking — either for free or at a certain rate — and you may be able to update your end on a daily, weekly or monthly basis. But, in most cases, vendors aren’t willing to give you that information. Back to the drawing board, again? Doesn’t have to be! We’ve scraped a multitude of data for our clients since our launch — from event information in Manchester, England, and boat dealers in Canada, to match summaries of the English Premier League. You name it, we’ve scraped it! 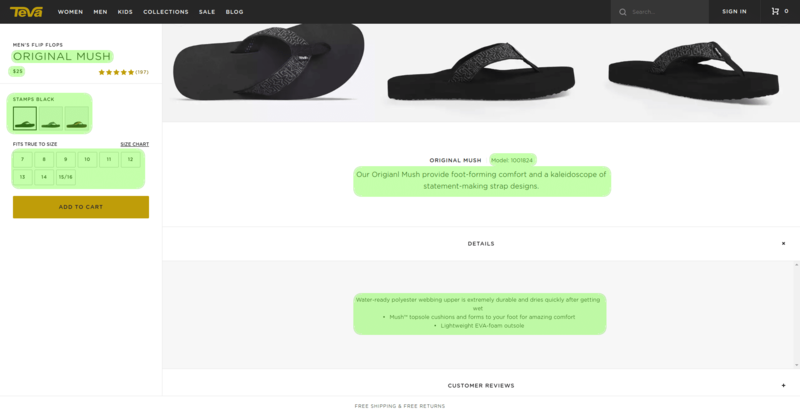 Getting back to our footwear eStore launch, let’s say you have Teva® as one of your manufacturers, and you want to list all of their products on your website. As discussed earlier, options 1 and 2 are both out the window for this one, so you’ve recruited Grepsr to fetch the data. All you need to do now is list the URLs of the Men, Women, Kids and Sale sections, along with the fields you’d like to extract. Let’s assume you need the name, model, price (and original price for on-sale items), description, details, available colors and sizes for each item. Also, you want to get this data on a daily basis. Go ahead and send us an email with these requirements. Then just sit back and relax. We’ll take it from here! Grepsr’s team of experts will now set up a crawler customized to your requirements. 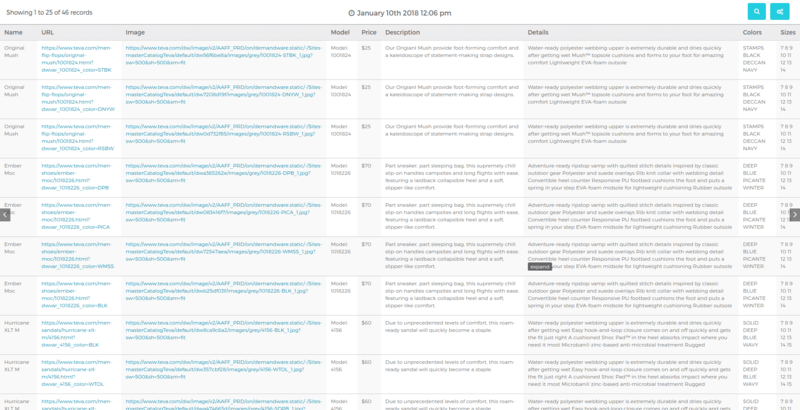 The crawler goes into each item’s page and extracts all the information you’ve requested. When it’s done fetching all your data, we’ll send you an email with a download link to your desired file format. If you’ve chosen to receive this report as a CSV, data from Teva’s Men’s collection page, for example, will appear as shown below. Thanks to Grepsr, you not only automated the process and saved considerable time, you also got accurate and up-to-date product listings for your website really quickly. You’re now well on your way to starting and managing your shopping portal without having to rely on your vendors. This was just one simple example showing how Grepsr for Chrome can make life easy for a startup. Whether you’re a free user or a paying customer, you get the full capability of our powerful scraping tool and experienced staff dedicated to your success. One last thing — don’t forget to say thanks! Update: Once your business is set up, here’s how you can track changes in your data.